The Swedish Theatre (Svenska Teatern) is a Swedish-speaking theatre and the first national stage in Finland. The theatre has two stages, big one with 500 seats capacity and small one with 127 seats capacity. 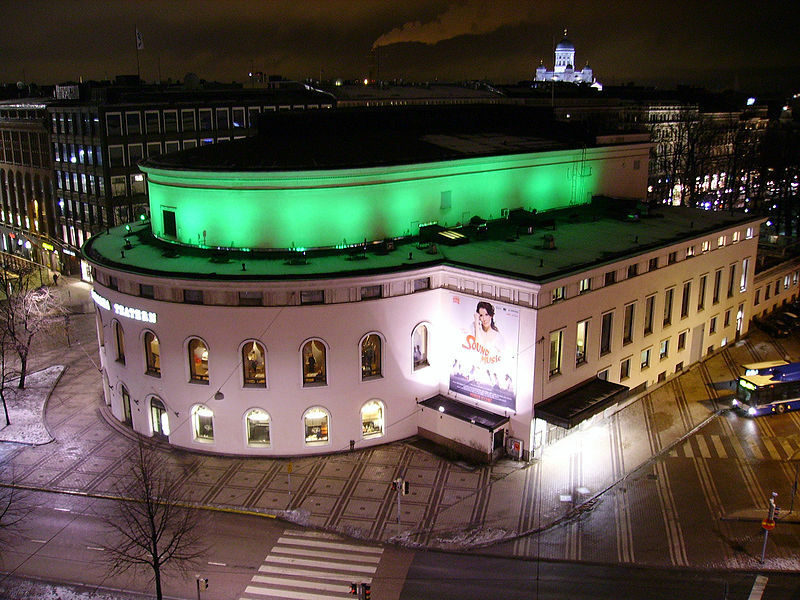 The Swedish theatre is among the most popular theatres in Helsinki with around 10 premiers per year. During the plays, the facade of the theatre is lit in different colours depending on the type of the play. Green colour is for swedish speaking drama, yellow is for children and young, red for musicals, and blue for foreign plays and classics. The first theatre in Helsinki was completed in 1827. The wooden building designed by architect Carl Ludvig Engel was located in the corner of Mikaelsgatan and Esplanaden. The theatre designed by Engel soon became too small as the interest in theatre grew rapidly among the citizens of Helsinki. 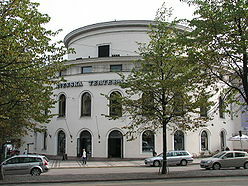 The new theatre building was opened on 28 November in 1860 on the same site as the current Svenska Teatern. This one was soon destroyed in a fire in 1863 and a new one in Neoclassical style was opened in 1866. The building of Svenska Teatern was renovated in 1935 and the richly decorated facade of the building was replaced with a new facade representing functionalism. Svenska Theatern is basically in the center of Helsinki so by foot is the easiest. Price examples: Adults: Partarre 45€, Balcony 38€; Children and students 30€ for all seats; Pensioneers 40€ for all seats. Ticket sales is open on weekdays from 10:00 to 18:00 and one hour before the play. You can also purchase the tickets in any “Lippupiste” that are open every day from 7:00 to 22:00 or online at http://www.lippu.fi/ (here also the addresses of the “Lippupiste” offices.